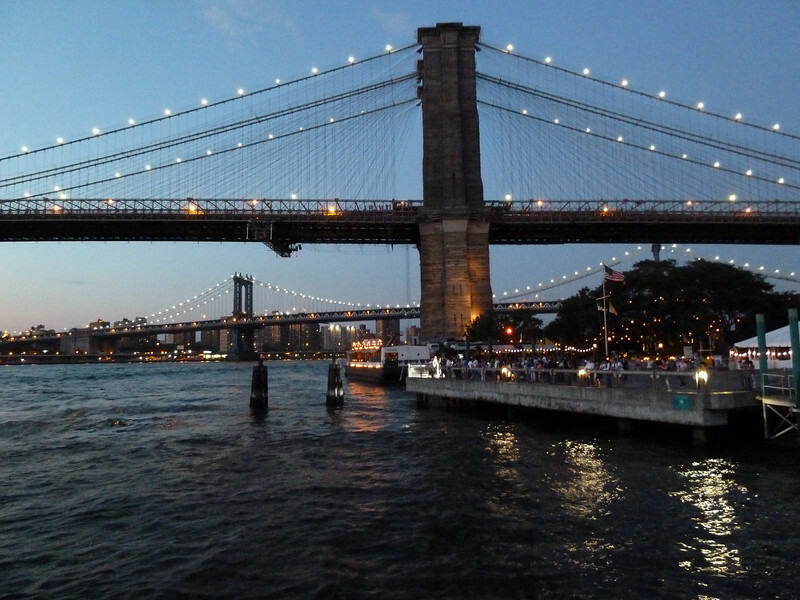 The Brooklyn and Manhattan Bridges. Taken at dusk on my very first bike ride in Brooklyn. I actually wore my helmet ! I mentioned to the doorman on my way out ( who even opened the door for me...lol) that it was my first time riding in Brooklyn and hopefully I wouldn't get killed. After paying 75 cents! to fill my tires I took a neat 5 mile spin around the Heights and the new Brooklyn Bridge Park and Dumbo. This is just a quick snap from the park. Beautiful composition of the 2 bridges. Lovely composition. Lovely night shot. I like the perspective of looking under one bridge to see the other. The lights in this night exposure turned out well too. Sounds like a successful first ride, so maybe more are to come? Have fun and do stay safe with that helmet. Excellent evening view. Lots of clear details and evening mood. Well done.